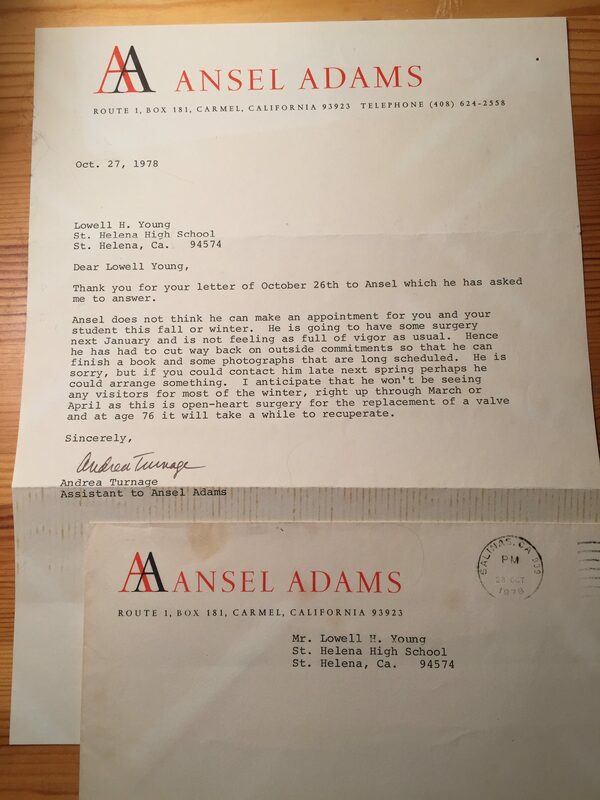 Although I have never met Dr. Michael Adams, son of Ansel Adams, our spirits were recently engaged in a splendid synchronicity that began nearly 40 years ago. It involves a revolutionary advanced biology class that I was privileged to participate in at St. Helena High School in the Napa Valley. It was revolutionary because the students elected to eschew the traditional practice of memorizing all the parts of a fetal pig in exchange for exploring the physical, mental and spiritual aspects of Yosemite, Grand Canyon and the Mendocino Coastal area. 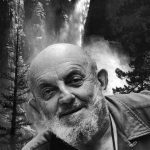 The class was dedicated to, “the illimitable freedom of the human mind.” Instead of pigs, we considered the great biological scholars, sages, poets, philosophers and artists, including world-famous photographer Ansel Adams. We kept two different coffee-table-format books of his photography in the biology classroom. The evolution of the class was the result of teacher-student collaboration as evinced by this blog. The great biologist, Louis Pasteur, opined, “chance favors the prepared mind” and we spent much pre-trip time and effort preparing our minds. E. g, before the Yosemite trip, the students were expected to read, “The Wilderness World Of John Muir,” edited by Edwin Teale. Along with wonderful stories and ecological wisdom, the book includes an illuminating chapter on John Muir’s philosophy. Students were also required to select an appropriate topic for an expository essay. The Class of 1979 included Lori Evensen, a very bright, very curious, highly talented artist. 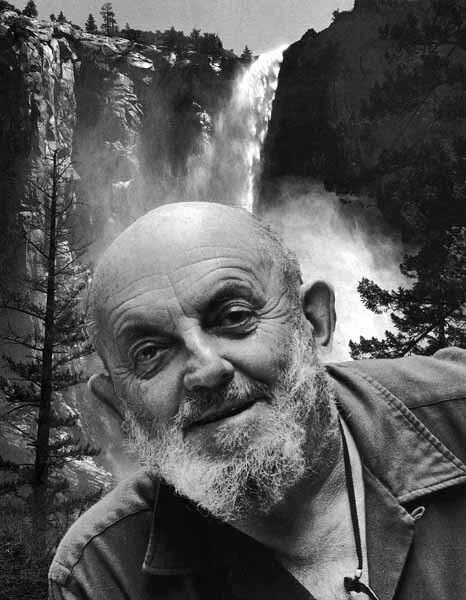 Not surprisingly, she chose Ansel Adams as the subject of her essay. At the end she credited Adams for inspiring her to continue her artwork. She also mentioned that it was now a dream of hers to meet him and perhaps attend one of his Yosemite photography workshops. He went on to say that his aunt and Mom (Jane Snowden) have several of Adams’ original prints, which are quite valuable. He also mentioned that Adams was very gregarious and would probably welcome a visit from an aspiring young photographer. I was astounded by the conversation, but doubted that it would yield any results. However, Mike called either his aunt or Adams and arranged a suitable time for a visit. Apparently, along with his willingness to share his artistic philosophy, he was planning to demonstrate some of his darkroom skills. A mutual friend of ours owned a small airplane and volunteered to fly Lori down to Carmel, Ca. for the day. All was in order. Sadly, however, a few weeks before the scheduled visit, Adams suffered a heart attack and all scheduled meetings had to be canceled. Lori graduated and I taught for 20 more years until I retired. After several years of reflecting on the mystery, wonder (even small miracles) experienced during 63 trips into the wilderness, I decided to attempt to write a book and share a sample of the student discoveries. Shortly after “Biodesign Out For A Walk” was released, we created a website to expand our reader base. 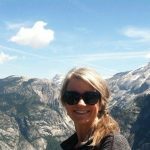 A couple of years ago, I started writing blogs for the site. After a friend shared a photo of this year’s luminous reappearance of Yosemite’s mystical “Horsetail Fall,” I decided to write a blog about it. Of course, I had no foreknowledge that, while viewing a Youtube video on the extraordinary fall, Michael Adams would appear and complete this fantastic synchronicity. I sent Lori a copy of that letter and assumed that the multifaceted synchronicity was complete. It was not! Recently, without knowing what I was thinking, she began sorting through a collection of her high school memorabilia. 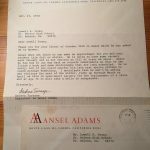 Much to her delight and surprise, she discovered a letter from Ansel Adams that she had totally forgotten. She was not alone. Even though the letter was addressed to me, I also had no memory of it. Although the letter is intriguing, perhaps more importantly, it reveals the quintessence of Adams. He was facing a potentially life-threatening open-heart surgery, yet cared enough about a total stranger (high school student) to express his regrets and offer her hope for a possible post-surgery meeting. The meeting never happened, however, his spirit has become immortalized in both Lori and my hearts. I sent a modified version of this story to Dr. Adams, expressing my deep appreciation and gratitude for the inspiration his father provided for our students and me.